Have you ever stopped to take into account how much time you spend indoors each and every day? Whether you are at home, in the grocery store, at the mall, or even spending 8 hours a day at work. Most Americans work an estimated 40 hours a week and most of this time is spent indoors, inside an office building. 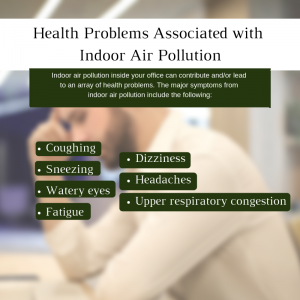 Depending on the office building and/or the size of the company, the number of employees held within the building can vary – but with more and more people in a shared indoor space the greater the risk of indoor air pollution inside the confined environment. Inside an office building debris and pollutants can gather including dirt, dust, and other air pollutants which collect and build-up, impacting the air quality. Not to mention – the added impact on renovation or new building construction on the air quality inside the environment. 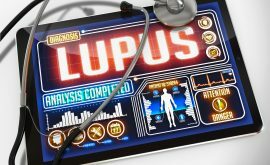 An office that experiences poor indoor air quality can mean or lead to Sick Building Syndrome, which can than lead to sick employees who experience onset symptoms unexpectantly. For some people who work in an office, you may be wondering ‘how can I inspect my office’s air quality?’. Well, for those individuals who find that they do work in an office with poor IAQ, certain characteristics will appear. An unpleasant or musty odor will taint the air and the building may begin to get hot and/or stuffy. People in poor indoor air quality will complain about symptoms that happen at work and that go away once you leave the building. These symptoms can range from a headache, fatigue, fever, cough, and even shortness of breath. Serious symptoms of poor IAQ can also lead to asthma and pneumonia. Indoor air quality describes how indoor air can impact a person’s health, comfort, and ability to work. A common place for poor air quality to reside is in an office building due to several reasons. Lack of Ventilation: Ventilation can cause major issues with the quality of the air inside an environment. When there’s a lack of ventilation it will trap pollutants inside the environment and contain them inside the space. This will dramatically impact the overall IAQ. Office buildings tend to have restricted ventilation and can be a cause to the air quality issue in the building. Poor Upkeep of Air Handling System/Heating System: The main purpose of an air handling system is to help maintain good indoor air quality through proper ventilation and thermal comfort. When these air systems are left dirty and backed up with allergens/debris, the air system will start to disperse these contaminants back into the air. Therefore, changing your filter and maintaining the upkeep of the system will help to improve IAQ in a building. Moisture Damage: When uncontrolled moisture occurs indoors it can cause major damage to the building structure – walls, ceilings, floors, and furniture. 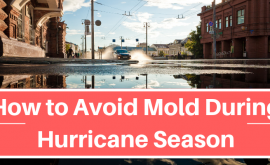 Moisture indoors will lead to potential mold growth that can significantly impact the indoor air quality inside buildings. Mold produces mold spores that are released into the air and act as contaminants in the air. Construction or Remodeling: Poor job site construction practices and chemical filled building materials can contribute to and allow for moisture and contaminants to become integrated into the buildings air. Utilizing preventative construction practices will help to reduce the potential air contaminants that will lead to poor IAQ. Air pollutants can be generated both indoors and outdoors, and these pollutants can vary. 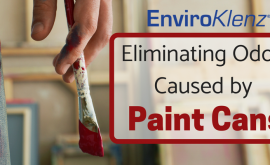 Some of the sources of air pollutants includes building materials, pest control, housekeeping, renovations/remodeling, new furnishing, and building occupants. Air contaminants found in buildings are broken down into three categories that include Biological, Chemical, and Particles. Biological Contaminants: Biological contaminants include bacteria, viruses, fungi, mold, dust mites, animal dander, and pollen. These contaminants form from inadequate maintenance and housekeeping, water spills, humidity, and from occupants. Particles: Particles are solid or liquid substances that are light enough to be suspended into the air. Particles can include dust, dirt, or other substances that may be drawn into the building from the outside. Improving the air quality inside your office is achievable and necessary to keep employee’s happy and healthy. The first step is to have the right tools to conduct an air quality test within the office. Experts in air quality have the right tools to be able to conduct this type of testing. These tests will show air quality measurement in the office, air flow to humidity levels, and ventilation issues. Secondly, you will want to adopt an office air purifier into your office environment to improve the indoor air quality. An office air purifier will provide a filtration technology for air to be processed thru to help maintain and improve air pollution levels inside your office. The EnviroKlenz Mobile Air System is an effective office air purifier that uses a patented earth mineral technology for chemical and odor elimination. 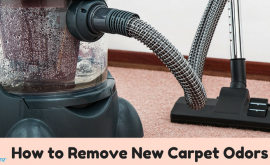 The technology is an absorptive process where it breaks down and neutralizes a wide range of chemicals, chemical odors, and noxious odors. The system also has a hospital-grade HEPA filter giving it the added capability to filter out and capture fine particulate matter larger than 0.3 microns in size. Offices can be a breeding ground for particles and air pollution to form and contaminate the air quality. However, being ahead of the game and prepared with a solution to poor indoor air quality, you will be able to minimize health risks and make your office a happier, healthier environment.